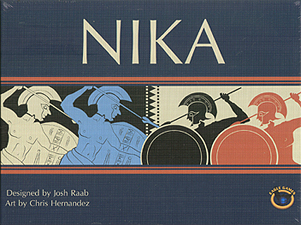 Nika is the Ancient Greek world for "Conquer!" The concept of Nika came to me in a dream while I was studying abroad in Athens. The rules were honed across nearly two years of testing. The board shape and core mechanics were inspired by ancient Greek geography and warfare. Greece has many narrow valleys and mountain passes, and sometimes the only way to defeat an enemy force was to collide with them head-on band literally push them off the fields. This ("shoving") is thought to have been the critical phase of most battles between hoplite armies, who were the heavy infantry that dominated ancient Greek war for four centuries. In this game, you command a Greek city's hoplite soldiers who must force their way through enemy lines. Your troops can push or rout those who would block their way across the narrow battlefield. Coordinate attacks with your ally to secure victory, but make sure to watch your flanks!